A specialised blend of our liquid floc combined with a concentrated polymer resin Maxi Floc Plus will settle debris and organic matter to the floor of the pool in 3 - 6 hours. Will not work if algae are present. What is the difference between a clarifier and a flocculent? A clarifier is designed to be used with a filter system, so particles coagulate in the filter. A flocculent is NOT to be used with the filtration system as the filter may clog. Flocculants are formulated to drop particles to the bottom of the pool, so they can be vacuumed away. Is Maxi-Floc Plus effective in salt-water pools? 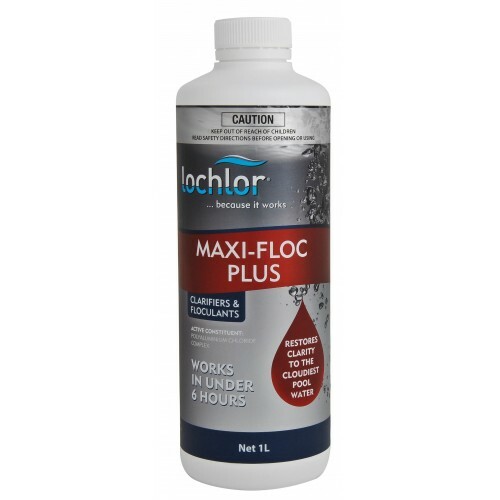 When using Lo-Chlor Maxi-Floc Plus in water containing rich concentrations of positively charged ions (salt-water pools) we always educate our dealers to be aware that the overall floc size is reduced. The result is a floc of lighter appearance and intensity than might otherwise be anticipated. We have combated this reduced floc size with the new polymer resin thus ensuring Lo-Chlor Maxi-Floc Plus is the most efficient and successful floc when used in salt water pools. 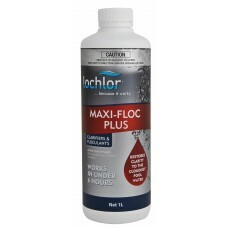 (55MFP5L): LO-CHOR MAXI FLOC PLUS 5LITRE HEAVY DUTY Liquid Flocculant. A specialised blend of ..
(55MLC1L): LO-CHLOR MIRACLEAR LIQUID POOL CLARIFIER 1LITRE HEAVY DUTY Clarifying Agent Arguabl..
(55MLC5L): LO-CHLOR MIRACLEAR LIQUID POOL CLARIFIER 5LITRE HEAVY DUTY Clarifying Agent Arguabl..
(55MFP20L): LO-CHOR MAXI FLOC PLUS 20LITRE HEAVY DUTY Liquid Flocculant. A specialised blend o..